Today, half of the world’s population lives in urban areas. In 2030, the global urban population will number 4.9 billion people, i.e. 60% of the population. Almost all global population growth will be in the cities of the South, where population will double from two to four billion people. Taking in two billion new urban dwellers means building and providing for the equivalent each year of seven new cities of ten million inhabitants, that is seven ‘Shanghais’ or ‘Jakartas’, or ten ‘Londons’ per year. Such massive and rapid urbanisation requires gigantic ‘urban settlement’ investments failing which the potential advantages of city life will not be accessible to the poorest. It determines the energy consumption and their greenhouse gas emissions. Sustainability, in terms of the threat of climate change, of urban growth in the South needs to be analysed. Urban transport energy consumption too needs immense focus since this is where the most challenging problems need solving and this is where the policies adopted in the immediate future will have a crucial impact on long term energy consumption. Energy consumption by urban transport already represents a large share of the urban energy balance, generally equivalent to the residential share, which is between 20% and 50% of total urban energy consumption (excluding industry). The trends forecast that it is this consumption that will experience the highest growth. Experts agree on a current trends scenario in which urban mobility based on individual motorised modes of transport experiences a boom. Urban spatial structures, whose influence on the demand for transport and therefore on transport energy consumption is easy to understand, have a lifetime and resilience far greater than those of buildings. Urgent action is required on this score and action now will condition the future for a very long time. Importance of urban factors: A study by Kenworthy (2003) of 84 “global cities” provides valuable points of comparison and shows the extreme diversity of cities today. CO2 emissions released by urban passenger transport systems vary by a factor greater than 100. The share of public (versus private) transport in such emissions varies from over 70% in Manila or Dakar to less than 1% in Atlanta. Prosperity measured in the annual GDP per capita is not a factor which is highly correlated to the rate of private motorisation. Even with similar motorisation rates, actual use of cars may vary considerably from one city to another. As a result, energy consumption due to private transport related to wealth, measured in MJ/$1,000 of GDP, does not increase systematically with GDP per capita. The highest levels are to be found in three groups of cities: African cities with 2,200 MJ/$1,000 of GDP and cities in the United States and the Middle East with 1,900 MJ/$1,000 of GDP. High-income cities in Western Europe and Asia perform best with only 489 and 303 MJ/$1,000 of GDP respectively. Other regions average 1,364 MJ/$ of GDP, in between the two extremes. As regards infrastructure, the length of urban expressway available per capita is particularly high in the United States (156 m/1,000 inhabitants), Australia and New Zealand (83% of the American figure) and in Canada (78% of the American figure). In other regions, the urban expressway network is not extensive, particularly in Latin America and in China (2% of the American level). If the expressway is related to wealth (instead of the number of inhabitants), the results are reversed: Poor cities provide a little more urban expressway facilities than their high-income counterparts – 4.5km compared to 4.1km/$1,000 of GDP. The public transport supply, evaluated as seats-km per capita and per annum, is on average not very different in rich and poor cities: 3,336 in rich areas and 3,203 in poorer areas. As related to wealth, however, poor cities supply much more public transport facilities: 831 seats-km/$1,000 of GDP compared to the offer of rich cities, i.e. 126 seats-km/$1,000 of GDP. These findings highlight the impact of urban factors and the existence of alternatives to using cars on a city’s transport-related energy consumption. 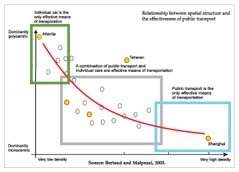 Research in the last fifteen years by Newman and Kenworthy on automobile dependence and sustainable urban development points out that there is a great deal of interaction between urban density and transport-related energy consumption. Low density metropolitan areas exhibit an almost total predominance of automobile use and total transport-related energy consumption is considerable (frequently more than 65,000 MJ/person/yr). High density metropolitan areas have a markedly more balanced tri-modal distribution with a clear emphasis on public transport (from 40 to 60% of travel). The total transport-related energy consumption is four to seven times less than in low density cities. In European cities, modal distribution is more balanced but cars are still very dominant, particularly in peripheral low density suburban areas. 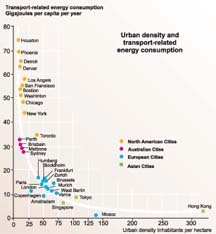 Total transport-related energy consumption is two to four times lower than in low density cities. While the general conclusions put forward by the researchers are not disputed, they have been criticised, in particular because the spatial distribution of activities and households is not analysed by them. The spatial structure of a city, in particular the relative location of homes, employment and amenities, also has an impact on the number and length of trips. However, it is argued by experts that an analysis of average density is not sufficient to explain transport-related energy consumption. They term the study ‘superficial’ as it leads to the “obsession with density”. A. Bertaud’s work seeks to respond to this type of objection. A Bertaud, in his research, defines urban spatial structure using two complementary components: 1) spatial distribution of the population and 2) spatial distribution of trip patterns of people when they travel between their homes and places where they either work or socialise. The direction and speed with which density in urban spatial structures changes as it progresses from the centre to the periphery, throws a great deal of light on the effects of regulating land and property markets on the urban space structuring process. A positive gradient is a factor for an increase in urban transport energy consumption, since for a given average density, in a city with a positive density gradient, the average distance per person to the central business district (CBD) will always be longer than for an equivalent city with a negative density gradient. It, therefore, seems reasonable to assume that journeys will be longer. In monocentric cities with a Central Business District (CBD), the trips are in ‘clusters’ through the urban area and outside the CBD and are easily achieved along the radial roads or by rail transport. In polycentric cities, i.e. the ‘urban villages’, where often the average density is low, everyone can walk or cycle to work. According to Bertaud, these ideal conditions have never been observed in any city. Public transport is incompatible with low density and dominantly polycentric urban structures. Bus stops and railway stations must be easily accessible from homes or workplaces and walking speeds do not exceed 4.5 km/hr. Acceptable walking distances vary with cultures and incomes, but various surveys have shown that city dwellers like to avoid walking for more than 10 minutes. As a result, public transport stops have an 800 metre catchment area, which can be extended using feeder systems, generally minibuses or collective taxis. But this kind of arrangement gives rise to classic inter-modal problems: Lost time, increases in direct costs if the system is not price-integrated, need for specific commuting infrastructure so that necessary investment costs are increased. Yet, investment in public transport infrastructure is only economically justifiable if housing and employment density is sufficient within the catchment area of the stops. As a result a consensus is emerging between researchers and urban planners on a density pertinence threshold for public transport of approximately 30 inhabitants/ha. 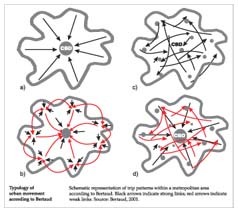 Bertaud’s approach helps to define what should be our objectives for cities if we are mindful of the greenhouse effect: To remain compatible with public transport, therefore, stay dense and moderately polycentric, or go back to this pattern, which is certainly more difficult to achieve. The main criticism of his research is that it does not take into account the structuring interactions between transport technology and urban forms. He does not attempt to broach the systemic complexity of the “transport-urbanisation” tandem, although this is where public policies can be effective. Considering the relationship between transport systems and urban structure from the opposite viewpoint, some authors believe that the way in which saturation of the infrastructure transport system is managed will define the urban form. On a sample of world cities, researcher Zahavi observed a double budget and time constant in urban mobility: On the one hand, the average time spent daily in transport is constant and equal to one hour; on the other hand, urban dwellers spend on average 11% of their budget on transport. As a result, the daily time budget devoted to transport remains constant despite developments in the speed of travel. If a transport system is faster and cheaper, city dwellers will use it to travel more and to cover a greater distance, not to save time or money. If transport infrastructure permits, users prefer to broaden their range of options rather than reduce the general cost of travel. The speed of transport systems then defines individual travel range. Since walking can cover 5km/hr, and therefore permits a 2.5km return journey to be covered in one hour, it gives access to a 20km2 range (a circle with a 2.5km radius). Similarly, since car travel, on an average, is 10 times faster, the accessible area is a hundredfold larger, i.e. 2,000km2. This way, the speed of transport modes has a highly modifying effect on urban appearance. An increase in the average speed of a transport system leads to lengthening travel distance, with as a result, urban sprawl and reduced density. Researcher Barter replaces the notion of “automobile-dependent cities” of Newman and Kenworthy by “traffic-saturated cities”. In traffic jams, public transport is slower than private vehicles, so that only people who can buy a car or a motorcycle can increase their speed of travel.